The Frick Collection opened its historic Fifth Avenue Garden for its Spring Party on Wednesday, June 7, 2017 from the hours of 6:30-10:00 PM. 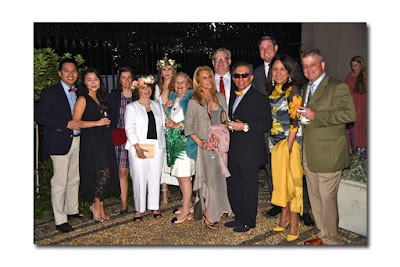 It was a delightfully balmy evening conducive to a fantastic garden party which contained cocktail, hors d'oeuvres and live jazz music under the magnolia trees. Stella Artois and Absolut Elyx provided the beer and cocktails. 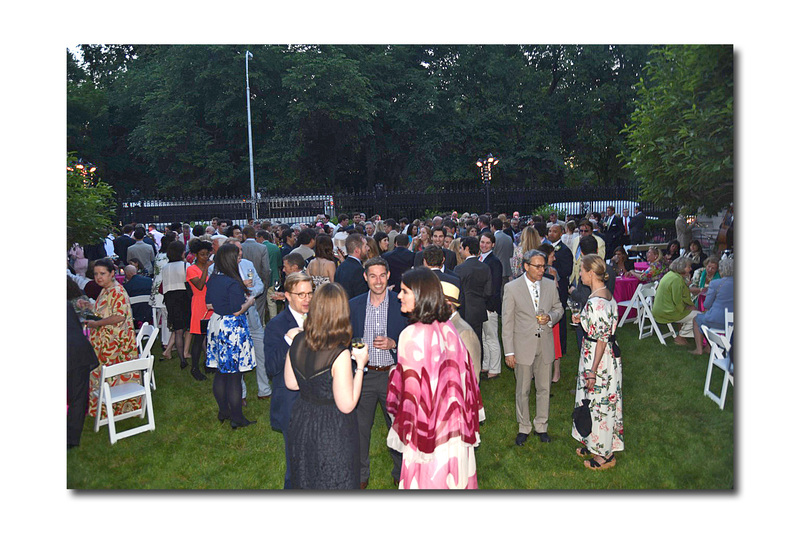 There were over 650 guests who attended in lavish attire reminiscent of a bygone era of romanticism and whimsy. 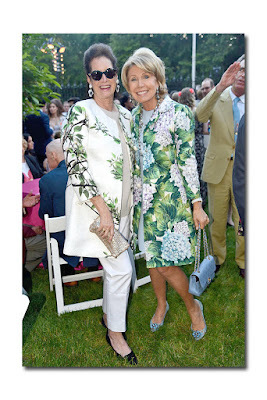 As I headed out to the garden I spotted Christine Schwarzman in a beautiful green and blue floral dress-jacket combination conversing with her friend Martha Fuhrmann who was also wearing white and green floral. Flowers and vivid colors were the dominant trend in clothing and even the men came dressed to impress in green, yellow and orange suits with some brave enough to don lavish floral hats. Throughout the evening, guests were allowed to view works of art from the permanent and special exhibition galleries and even permitted to explore the mansion's rarely seen second floor. 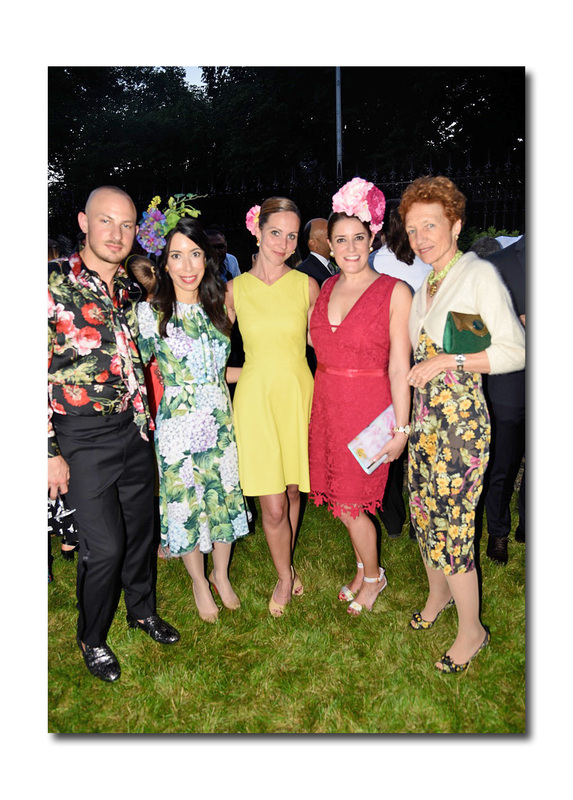 This year's party coincided with the opening of "Fired by Passion: Masterpieces of Du Paquier Porcelain from the Sullivan Collection." 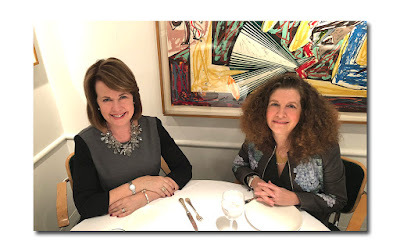 I had the opportunity to speak with Paul and Melinda Sullivan who gave a large portion of their 160-piece Du Paquier Viennese porcelain collection for the Frick exhibition. The Du Paquier porcelain collection from early 18th century Vienna has an interesting history with Claudius Innocentius du Paquier, founding the manufactory in 1718, the second factory in Europe to produce the coveted Asian porcelain known as "white gold." Porcelain had been manufactured in China since the seventh century but did not reach Europe with regularity until the mid 16th century. 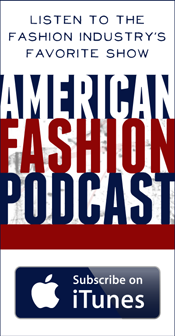 Over the next two centuries all the porcelain available in Europe was imported from Asia. That is until 1708, when the German chemist Johann Friedrich Bottger produced true hard-paste porcelain by combining local clays with ground alabaster. This secret was so strictly guarded that the King of Poland, Augustus II, who founded the manufactory, moved it to a desolate castle in Meissen in 1710 to guard this treasure. 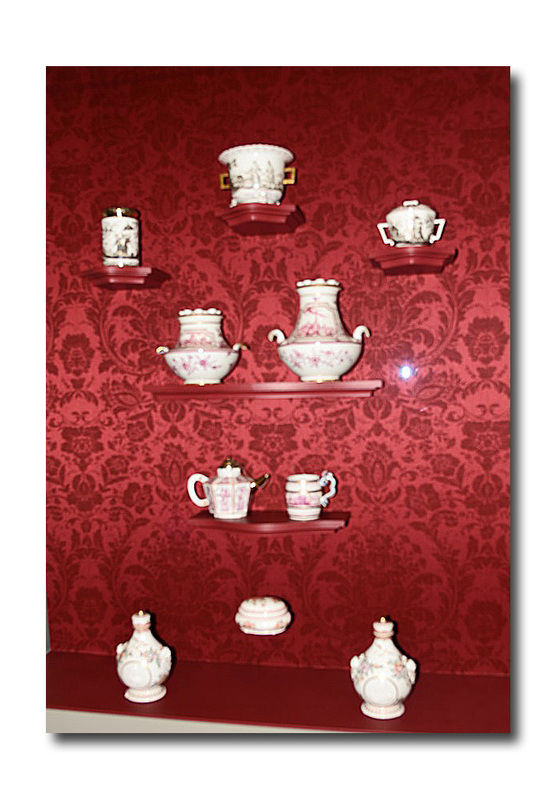 In 1717 Claudius du Paquier, an agent in the military ministry, opened a porcelain factory in Vienna, recruiting several day employees from the Meissen location; and in 1718 Charles the VI granted him the exclusive right to establish a porcelain factory in Vienna for the next 25 years. The richly ornamented pieces that Du Paquier created drew inspiration from Vienna and the court of the Hapsburgs and challenged the dominance of porcelain from Meissen and East Asia. However, the smallness of his enterprise coupled with the exorbitant costs of such richly produced porcelain forced him to sell his factory to Maria Theresa, Empress of Austria. The factory operated under a different name until 1864, but the pieces made during Du Paquier's ownership continue to be the ones that produce the greatest exuberance due to their originality and richness. The pieces are all hard-paste porcelain and are a mix of baroque and East Asian influences combined with western culture. 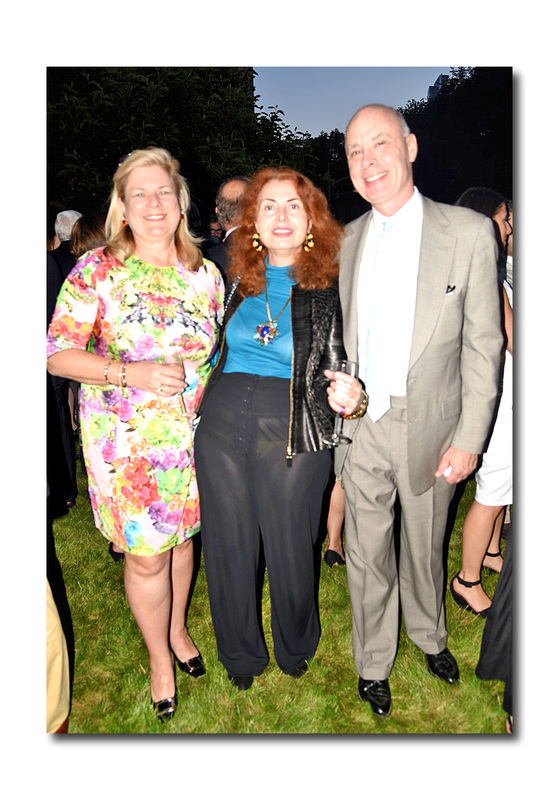 The funding for the exhibition was provided by Fiduciary Trust Company International with additional money given by Alfredo Reyes and Anne Groves. The pieces on view were lovely with gold and red accents decorating the lavish collection and many of the guests were art experts as well as donors and young members. There was even a DJ playing pop music with guests enthusiastically dancing and drinking. 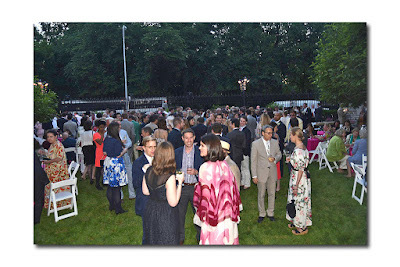 As the hour of 10PM approached, guests were forced to leave this magnificent venue after an evening of revelry heralding the beginning of the imminently arriving summer.